Week 16 PacHoops Pac-12 Power Rankings: March. Between Brian Williams’ impending job status, John Stewart stepping down, and the fact that I watched Junior Varsity basketball last night, I’d say the world is in flux. I don’t own any The North Face clothing and I’m going to Seattle on Friday. Maybe we can find clarity in a week of Pac-12 basketball? GotW: Any game that might have tournament or Vegas seeding implications. Which is to say any game that involves a team that, as of publish, has 7 or 8 losses. Which is to say that eight of the twelve games this weekend have NCAA tournament implications. It is March after all. Furthermore, a top-4 finish is a coveted spot with Vegas right around the corner. That earns you a first round bye, one fewer game to potentially lose to the likes of USC (Cal) or Washington State (Washington and Utah). Cal is hosting for their tournament lives this weekend and Stanford could be, too. Oregon has rattled off an impressive five game win streak and has themselves primed for an invitation after being left for dead just 3 weeks ago. Colorado? With that question asked, the feeling that I must pick one GAME of the Week, and a March flair for the dramatic, we could see Saturdays’ penultimate Pac-12 regular season game (UCLA @ WSU closes this thing out) featuring Colorado in Berkeley as the GotW. Pending the mid-week results, this could be a battle royal for a spot in the dance. Game to Avoid: If we’ve technically got eight games of the week then is it really that tall of an order to suggest we ignore the only other four games? Of course it is! This is March basketball. Almost nothing is worth ignoring except for Thursday’s game between USC and Washington State. What do you want me to say here? These are the last two teams in the conference and have combined for three conference wins. Watching this game could be more difficult than getting a deal done with the Chinese (#TeamUnderwood). Something to Prove: Two games, with arguably a jaunt in Las Vegas, for the Oregon Ducks to prove to the committee that they deserve an invite. Which is a really interesting position considering all of the work they’ve done to prove otherwise. Alas, they swept Los Angeles and are riding the aforementioned momentum of 5 straight wins. According to Bracket Matrix, they’re back in the mix. Of the 68 brackets aggregated, 66 include the Ducks. And of course with great power comes great responsibility. The power in this equation is the guests. Arizona and ASU pose the toughest travel tandem, the perfect opportunity to solidify a resume. The responsibility, however, lies in the ownership of their own destiny. They earned that right by running through their non-conference slate and rattling off their last five. They are responsible for their own tournament invitation. A challenge to force the committee to keep them out. Also, Mike Moser is en fuego. He’s averaging 17.6 ppg and 10.2 rpg during this five game win streak. Someone’s trending up and someone’s trending down. The Ski schools will be in the Bay (I’m going to try and make it over to Boulder on Saturday) and pose a significant threat to whatever chance the Bears have in maintaining their spot at the ball. 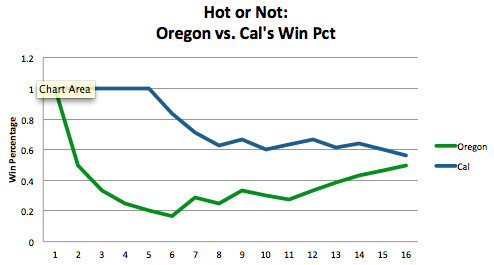 Because how ‘hot’ a team is plays into the judgement of the committee and Cal certainly ain’t hot. The YouTouber: “You blew a wide open layup.” Gold.